Thursday, June 7, 2018. 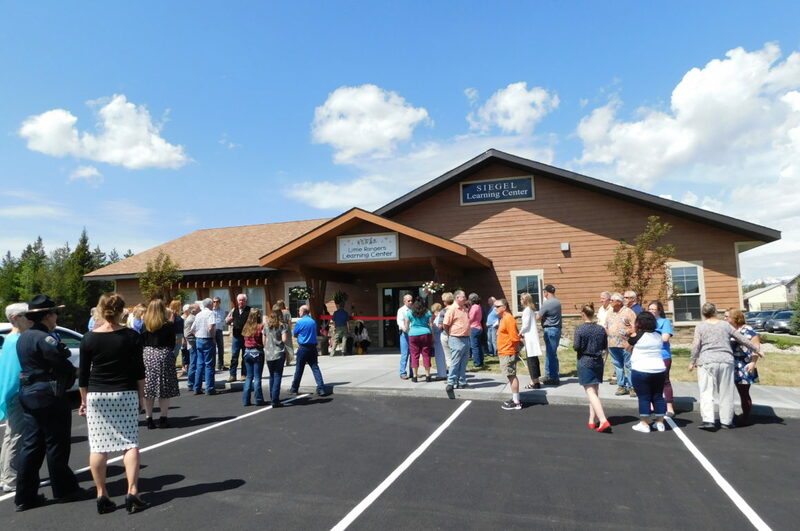 Folks in West Yellowstone gathered Thursday to celebrate the grand opening of the Siegel Learning Center. This beautiful, state-of-the-art building now houses the Little Rangers Learning Center — an early education program that teaches and supports little ones before they get to kindergarten. New businesses and community organizations pop up all the time in our state, but there was something different about this ribbon-cutting ceremony. You could see it in the eyes of the people in the crowd, and hear it in the voices of the folks that spoke. This achievement, and the journey it took to get here, is one for the books. From Wolf Point to West Yellowstone and everywhere in between, Montanans are grappling with their shared need for childcare and schooling for our pre-kindergarten kiddos. This issue impacts everyone — from parents to grandparents, from teachers to business owners. The folks in West are no strangers to finding unique, long-lasting solutions to their problems. The Little Rangers Learning Center is a prime example of what one small community can achieve when the local government, businesses, and non-profits come together. The Little Rangers Learning Center began five years ago in the back room of West Yellowstone’s Public Library. It quickly filled to capacity, and when the town’s only daycare center closed last year, families looked to the folks at Little Rangers for help. What were these parents going to do if they couldn’t find an affordable, reliable place to take their kids during the day? What would happen to these little ones if they couldn’t learn the skills they needed to prepare for kindergarten? (left) The back room in the library where the Little Rangers Learning Center had been run for years. (right) One of the many rooms in the new Siegel Learning Center. This room is dedicated to teaching kids science, technology, engineering, and math. The Little Rangers Learning Center temporarily moved to the Protestant Church while seemingly everyone in town (and really, we mean everyone) got to work. The Town of West Yellowstone gave $650,000 towards constructing a new facility for the Little Rangers, and they gave the land. This is unique for a town government to put public money into a program like this, but everyone on the town council supported the decision. “Day care is as important to us as sewer, water, and electricity,” said Pierre Martineau, a member of the Town Council since 2009. Once the town approved the project, construction began 7:30 the next morning. Greg Forsythe, the project manager, and Tim Heideman, the contractor, led a team that worked tirelessly throughout a record-setting winter to have the building finished by the summer. Katie Ostberg gives a tour around the Learning Center. Trent Sizemore’s photo hangs behind her. Private donations poured in to support the Learning Center. The Police and Fire Departments advised them on how to make the building as safe as possible. And folks from the community offered whatever skills they could share. One mother volunteers to do the bookkeeping, and Trent Sizemore, whose wife works at the Learning Center, took all the beautiful wildlife pictures that hang on the walls. Carrie Pope, the director of the West Yellowstone Foundation, summed it up nicely. Pope is the daughter of Steffi and Arne Siegel, who started the Foundation 25 years ago. The foundation put their full support and effort, as well as a lot of money, behind the project. “Not one of us alone could have done it,” she said. Little Rangers provides a high-quality, affordable learning opportunity for up to 70 little ones. The building and the curriculum are designed with the kids in mind. The furniture, bathrooms, shelves, and windows are all constructed to fit young children and to help them become more independent and self-sufficient. (left) Greg Forsythe, the project manager, kneels down to show Commissioner Seifert the kid-sized automatic sink. (right) In the pre-K room, some kids play the sleeping animal game while other kiddos read in another part of the room. The classrooms are split for the different ages, as are the activities — most of which revolve around play. There’s even a room dedicated entirely to experimenting with science, technology, engineering, and math. As the town grows, there is room to expand the building and offer the program to more families. And hopefully, if they can secure more funding, they will be able to offer pre-K for free. You don’t have to be a parent in West Yellowstone to feel the impact of the Little Rangers Learning Center. Business owners and employers know that if their town doesn’t have a place for little ones during the day, they will lose their workforce. Bruce McPherson — the director of the West Yellowstone Public Library who started the non-profit pre-K five years ago — half-jokingly says that without a childcare facility and learning center, the only company that benefits is U-Haul. If families can’t find a place for their little ones while they’re at work, the parents will rent a U-Haul, drive off, and get out of town. What’s happening in West Yellowstone can be an example for the whole state. All three Gallatin County Commissioners were at the grand opening, as well as Governor Bullock. Seifert continued by emphasizing what folks in West echoed throughout the day — if the kids succeed, then the parents succeed, and then the town succeeds. Governor Bullock, speaking as both a parent and as an advocate for early education, acknowledged the impressive work that the community in West had done. And that goes for all of our Montana communities. For our small, rural towns to succeed, there needs to be a safe place for working families to send their little ones during the day. And if there isn’t? Well, then they’ll be taking that U-Haul out of town. Interested in learning more about the Little Rangers Learning Center? Go for a tour and meet some of the folks behind this story on June 16. The Little Rangers Learning Center will have their open house. Updated on June 13th at 2pm.